And then, you hire a lawyer because, as seen above, they totally did not give you all the inches they promised. At least that’s what one guy did. In 2013, a Subway fan named Jason Leslie took action against the sandwich giant, claiming that he was owed some compensation for a lifetime of eating under-length sandwiches. Leslie, according to the New York Post, had averaged about 50 such sandwiches a year over the past 14 years (his entire adult life; he was 32 at the time). And those sandwiches, advertised as foot-longs, were almost certainly only 11″ long. He and another customer hired a lawyer and filed a class action lawsuit against anyone else aggrieved by what he and others considered a slogan of deception. But that argument, like almost all the Subway bread out there, seemed to fall short. So, in 2016 — yes, three years later — the sandwich maker agreed to settle the lawsuit. According to Eater, Subway “agreed to take steps over the next four years to ensure its bread is reaching its full 12-inch potential” and paid each of ten plaintiffs $500 for all those lost sandwich-inches over the years. Oh, and the lawyers who brought the lawsuit? Subway agreed to fork over more than $500,000 to them, too. Unfortunately for those lawyers, though, they ended up on the short end of the stick. One of the plaintiffs, an attorney named Ted Frank (who, not-so-coincidentally, works to detail frivolous class actions, in this case by busting it up from the inside) appealed the settlement, arguing that he got only leftovers while the lawyers in the case took home all the lettuce. A year later, an appeals court reviewed the settlement and agreed with Frank, stating that “a class action that seeks only worthless benefits for the class and yields only fees for class counsel is no better than a racket and should be dismissed out of hand.” The author of the judicial opinion, Judge Diane Sykes, “noted that ‘short’ sandwiches contained no less food by weight,” according to Reuters, and also found $500k in fees on a $5k award kind of ridiculous. The court reversed the lower court’s decision to certify the class, effectively throwing the case out. 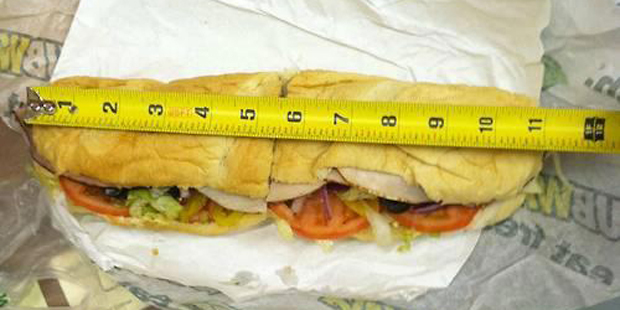 But don’t worry: future Subway footlongs will probably be 12″-long anyway. The company, which had decided to push for an actual foot of bread after Corby’s photo went viral (and before the lawsuit was filed), didn’t backtrack on those efforts, despite the victory in court. Bonus fact: There are about 25,000 Subway franchises in the United States. To put that in perspective, as of 2013 (per Consumerist), that was more than the number of Starbucks and McDonald’s combined. From the Archives: The Tool That’s Made to Be Broken: See the tape measure in the image above? See the little metal part at the end? It’s loose. How can I be sure? Because that piece is always loose. It’s not broken — it’s by design. Here’s why.